Dancing water speakers 1. A set of dancing water speakers is an easy way to spice up your music listening and can change the feel of a house in seconds. 2. Just plug these speakers into your iPhone, iPad, iPod, mp3 mp4 player or home computer and let the party begin. 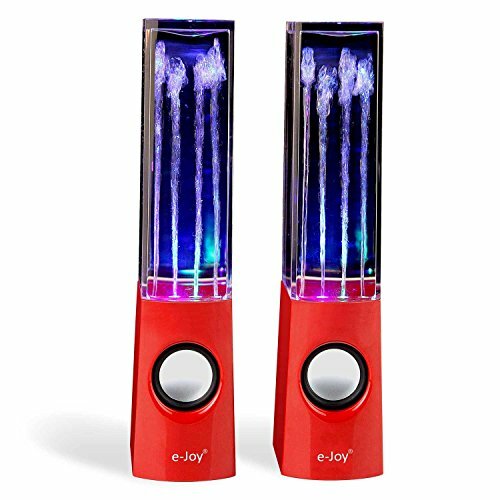 3 these one of a kind dancing water speakers shoot water into the air while dancing to the rhythm of your music. 4 the multi-colored LED In circle lights reflect off the water as it shoots out of the base creating many awesome visual effects of a light and water show. Dancing water speakers specifications connectivity technology: Wired dancing water speakers audio output channels: 2.0 rams rated power: 5w number of driver: 2+1 frequency range: 90hz ~ 18khz power requirements (input): Dc 5v 850a (max) headphone connectivity: 3.5mm LED In circle light: 8+6+6 weight: (Subwoofer) 2050g5g, (satellite) 380g5g compatibility dancing water speakers works for iPhone and iPod, pc, mac, mp3, mp4, mp5 and other audio devices. Package contents black water dance fountain speaker power adapter (12v3a) USB cable audio cable user manual intellectual property rights please make sure the package come with e-joy trademark package as well as user's manual for authenticity of product. Warranty this product comes with 1 year part warranty.